The LitterMate™ waste container can be bought individually or as part of the combo pack. 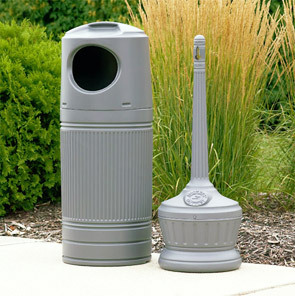 The LitterMate™ ash and trash combination pack includes a Smokers Outpost® cigarette receptacle and 30 gallon round waste container. Create a pleasing coordinated look at entrances, designated smoking areas, outdoor gathering locations and more. Perfect for any high traffic location. 25% Post Consumer Recycled Plastic. Uses standard 30 gallon trash bag. Bag is secured with twist and knot secure slot. Molded from high-density polyethylene for long-life and durability. Smokers Outpost®: 42"H x 15"Dia.